Okra is common in Southern cooking (as well as in Indian, Middle Eastern, and many African cuisines), but it is less well known in the other parts of the U.S. If cooked quickly, okra is crunchy; whereas long, slow-cooking turns the pods meltingly tender. Okra can get famously slimy, but there are ways of mitigating that (as discussed below) or harnessing it as a thickening agent, which is how okra is used in gumbo. In most of the U.S., okra is at its best from July through September. Okra likes hot climates and thrives in steamy, humid weather. Look for smooth, unblemished pods. Green okra should be bright green with a bit of fresh (even dewy) fuzz on its surface. Purple or red okra should similarly look fresh. No matter what the color, the stem end and the area around it brown quickly, so a tiny bit of browning there isn't the end of the world, but the brighter and greener the ends are, the fresher those okra pods are. Avoid pods with significant brown spots, dry looking ends, or any shriveled bits. Most okra is harvested when the pods are between 1 and 4 inches long. Pods longer than 4 inches tend to get into the tough category, which can be fine for stewing and gumbos but not ideal for quicker cooking. Okra is best fresh. Very fresh. Eat okra within a few days of buying it. Store okra loosely wrapped in a plastic bag in the fridge. Okra contains a clear, somewhat thick liquid which is how it stores water in the hot climates where it thrives. When you slice or chop okra, some of that liquid (or, let's be frank, slime) will release, getting on your knife and cutting surface. It cleans off easily enough with soap and water, however. Cooking can either tame or highlight its slime potential. To control the slime: leaving okra whole and quick cooking methods—sautéing, grilling, frying—bring out the crunchy, rather than the slimy, side of okra. Cooking okra with plenty of acids like vinegar, citrus juice, or tomatoes is another way to keep its slippery nature in check. 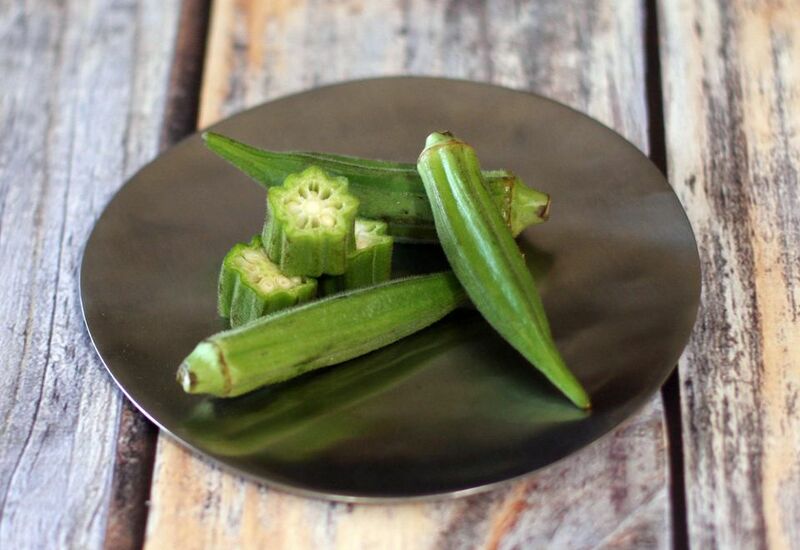 To use the slime: many great okra dishes use okra's slimy side to their advantage to thicken and add body. Gumbo, in which sliced okra is stewed with smoked meat, other vegetables, and seafood, is the most obvious example as okra gives the famous soup its characteristic hearty and satisfying body.